Actually, this wire wrapped flora pendant was completed last weekend. However, I was busy the whole week that I didn't get around to posting it till almost another weekend again! 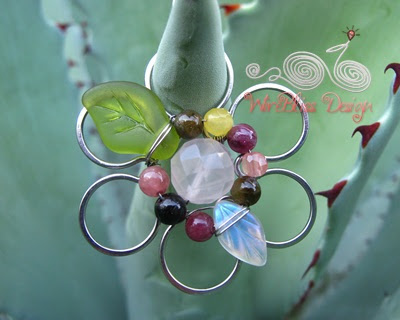 Stones are combination of Tourmaline, Cherry Quartz, Rose Quartz (Focal) and Czech Beads (Leaves). This one is my favorite so far although I have wire wrapped similar one back in June. Hammering was kept to minimum as the 19ga wire is already hard enough. Handmade jewelery seemed to have faded away in the past few years, with machine made ornaments taking over the entire industry. Very true but i think handmade jewelry is making a come back in a big way. As always, a gorgeous pendant Mei...will go with so much! Yeah! I love the color combination. Your works are excellent! How much costs this pendant? Hi Nusa - The pendant is US$29. It will be a remake.